The following is a speech given by Nonie Darwish at an event at UC Berkeley. Darwish is an Arab Muslim from Egypt. Her father was a terrorist martyred in the cause. Read more about the ideas Darwish discusses here: What Makes Islam so Successful? Thank you, Ms. Darwish. I will share this most enlightening and informative article with my colleagues. 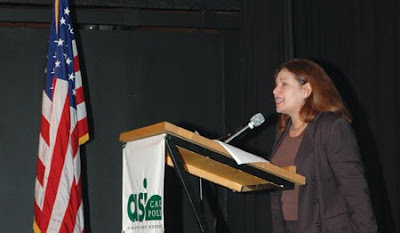 Mrs. Darwish - Thank you very much for courageously explaining to Americans what Islam truly represents. Our "political correctness" will truly be the death of our society and way of life, if we do not wake up. Thanks, I have mirrored it here, http://tulisanmurtad.blogspot.com/2011/01/muslim-woman-speaks-about-islam.html. Look at us posting anonymously. I live in Saudi Arabia. I have been astounded by the blatant lying that goes on. I couldn't understand why people were not embarrassed to lie when they must know that I and others know the truth. This article has provided an inkling of understanding. Because of my husband's work, I am afraid to publish my name. I admire Ms Darwish's courage and her intellectual spirit. Thanks for speaking out, Nonie, but don't count on the American left for help. Not going to happen, sorry. From what I see the American left is too far into protecting and promoting Muslim causes in the US and abroad. I know way too many Obama supporters that also support Sharia - that's a fact. Absolutely Obama himself has come out in support of Islam, Shari'a IS Islam just the legal aspect of it. Family Shari'a is just as bad for women especially. There is no GOOD Islam, only those who either don't know or follow the later writings of the prophet. And even they treat women like dirt. What a couragous speech, especially in Berkeley! Well done and take care! Why does she think that she should appeal to “the American left.” I thought that she had expressed disapproval of liars. Most courageous, but she targeted the wrong group. Leftist will turn her in and it won't be long before the accusation of lies will churn out from the left and the Islamics. She has to know by having this public speech, a fatwa will be issued and I know about those really well as my wife has one from her father's family (they're members of the Abu Sayyaf) for one of the unpardonable sins (coverted from Islam to Catholicism). Her speech should, for those with eyes that see, demonstrate how Islam itself is the core of the problem. The Koran is, as well as the following islamic writings, are deranged and evil with blame everyone else for their problems (no wonder the left allies itself with them). Her statement "In Christianity, 'we are all sinners' with Islam 'THEY'RE all sinners, we are Muslim" sums up the evil and dangers this faith has and how the two faiths are complete antithesis of each other. We here in the states are going to have to answer what Christ said, "you can't sit on the fence, you're either with us or against us". You can't be Muslim and for peace or love (remember, love doesn't appear once in the Koran), while you can't be Christian and be for hate, evil and wonton destruction. 2. totalitarianism - there is no seperation of church and state in islam: sharia law governs all. there is no free will in islam: only submission to the will of allah as conveniently determined by the imams who spew vapors to feather their own nests. 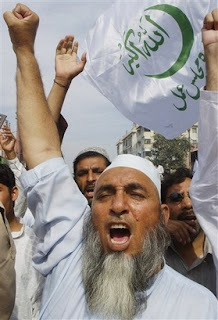 there are no moderate muslims: they all support sharia law. 3. violence - of all religions islam leads the pack in violent tenets for their ideology & history: containing eternal canonical imperatives for supremacy at all costs using violence & intimidation as basic tools to achieve these goals. 5. misogyny - present day islam is still rooted in 8th century social ethics: females are treated as property of men good only for children, severely limits their activities, dresses them in shower curtains and worse. While there are 300 references in the Koran to Allah and fear, there are 49 references to love. Of these references, 39 are negative, such as the 14 negative references to love of money, power, other gods, and status. Three verses command humanity to love Allah and two verses are about how Allah loves a believer. There are 25 verses about how Allah does not love Kafirs (non-Muslims). This leaves five verses about love. Of these five, three are about loving kin or a Muslim brother. One verse commands a Muslim to give for the love of Allah. This leaves only one quasi-universal verse about love: Give what you love to charity. But even this is contaminated by dualism since Muslim charity (the zakat) only goes to other Muslims. There is not one verse about either compassion or love of a Kafir, but there are twelve verses that teach that a Muslim is not a friend of the Kafir. Did anyone bother looking up Mrs. Darwish's religion before writing this? She WAS once a Muslim but she converted to Christianity shortly after immigrating to the US in 1978. Islam is an ideology. One does not remain a Muslim because of genetics. Idon't like like signing as anonymous as I think you should have the courage of your convictions,but we are not dealing with rational thinking people,we in the west are too trusting and don't like to come across as bigots ,the more I read about Islam and its converts -Muslims ,I believe it is trying to over take by -stealth and deception,,Sharia Law is `cruel,inhumane and intolerant to those who live under its male dominating system,whenever discussing Muslims ,you are acused of being -rascist,as Islam and being Muslim is -neither a race of people I find that questionable,their first agenda is to put an end to free speech,to stop any derogatory remarks about Muhammad and the Quaran,which I found to be a book of hatred and violence against infidels ,their arrogance in assuming their beliefs are the one and only true beliefs is insulting to other religions,they openly say they intend to take over and convert us to their religion?if the west doesn't stand up to them and stop them migrating to their countries ,they will succeed in their Jihad. Nonie Darwish is right. All you have to do is look at the persona of Mohammed and his early followers--never mind what they say in the hadith and qu'ran:. They faught in battles on a routine basis. This all speaks of conquest and egotism.. This is in contrast with the founders of the other main religions that survive to modern times (Jesus and Buddha). A brave lady. Thank you. Ms. Darwish provided so much valuable information - she brings so many important concerns to light. I admire her passion, her bravery and the way she explains the problems. But I want to comment on her conclusions and spark some more discussion. .
She says that religion must adapt to universally held concepts (and she listed our current ones of human/equal rights, freedom of choice, etc.). If a religion is truly divine, it isn't up to man to change it. It is up to man to evaluate it, accept or reject it. Man must distinguish between what the religion's doctrine and the way the doctrine is interpreted/implemented. The act of changing clearly stated doctrines is, in essence, creating a new man-made religion. She says "If Islam is a religion of peace, then we must demand better of our religious leaders." I have nothing against demanding the highest integrity from our leaders....but if you read the Koran, it is clear that "peace" isn't the agenda unless you belong to that religion. There are plenty of websites with the Koran and others that list quotes from it that clearly outline the problem of violent intimidation as a means to force the world into Islam. There are inherent temptations to carelessly murder others - promises that you will bypass the uncertainties of whether you have been good enough for heaven by dying in the act of jihad. The terrorists are acting in accord with Islamic belief as stated by Islamic scripture. There is nothing in the Koran that says - "oh, guys, when the world is full of people who are nice, but don't believe in what I say, we are going to skip the jihad part of my plan." Human rights, women's rights, freedom of choice - they begin and end with acceptance of Islam (and you had better not be on the wrong side of that decision or you lose your rights and freedoms, and the parameters of those rights are defined by Islam). This is bad enough without going into Islam's treatment of women and young girls, and the horrors those doctrines have brought into the world. Islam, as supernaturally revealed, is violent to all who do not submit. Period. There is no way to sugar-coat or change it without denying the revelation: "Allah" was wrong, or Gabriel was wrong or Mohammed was wrong, (a dissatisfied man with good intentions and pedophilic tendencies who lived in a patriarchal society or a man with good intentions who was mesmerized by a deceiving spirit.) or the transcribers were wrong or some combination of the above. I believe that the source of Islam is evil, and evil is clever enough to put the poisonous in with plenty of positive religious spin to make it appetizing and appealing. The fruit of this "revelation" has been devastating. It would be different if the revelation were wholesome and the implementation tainted by man's evil. If that were the case, then holding Islam's leaders to a higher level of integrity would be useful. But evil done in the name of Islam is often justified by its own Scripture. A true teacher of Islam cannot and should not deny the foundation of his faith, right? If he disagrees with it, he should renounce it. This is dangerous territory. A Muslim in search of truth is immediately in danger of some sort, depending on their living situation. Danger of being shunned by some family and community members at the least, danger of losing their health and/or life at the other end of the spectrum.